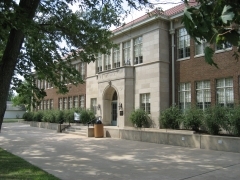 Sumner and Monroe elementary schools are associated with the landmark 1954 Supreme Court case Brown v. Board of Education of Topeka, and are significant in the areas of law, politics, government, and social history. In this case, student Linda Brown was refused entrance into Sumner Elementary after attempting to transfer from Monroe Elementary because she was an African American. Her father, Reverend Oliver Brown, was the principal plaintiff in the case when the suit was filed in 1951. The distance of the Monroe Elementary School from Linda Brown's home and the proximity of the Sumner Elementary School to her home was the central reason Reverend Brown agreed to be a plaintiff in the case. The US Supreme Court concluded that "separate education facilities are inherently unequal," denying legal basis for segregation in 21 states with segregated class rooms. North Topeka Baptist Church, built in 1921 and 1922, is located at the southeast corner of NW Gordon and NW Jackson streets on the western edge of the historic commercial core of North Topeka. 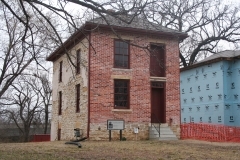 The building was designed by Williamson and Company of Topeka and built by G. Carlson and Son contractors for $40,000. It is an example of Classical Revival architecture and features a monumental front-gable portico supported by four Corinthian columns. A key turning point in the history of this building came in 1951 when a devastating flood affected much of the Kansas River valley. Much of North Topeka was under water as the Kansas River spilled out of its banks. Water was several inches deep in the church sanctuary. The congregation salvaged what remained, remodeled the interior, and built a new Sunday school building onto the south side of the church in 1952. The building, which still serves the same congregation, was nominated for its architecture. 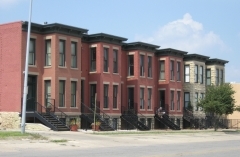 Bounded by Willow on the south; the alley west of Woodlawn on the west; Grove on the north; and generally the alley east of Greenwood on the east. 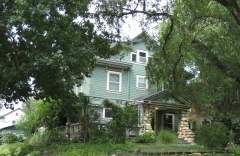 The John and Mary Ritchie House is located at 1116 SE Madison Street in Topeka. 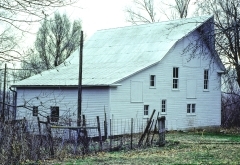 The Ritchies moved to the Kansas Territory in 1855 and became involved in abolitionist activities and local temperance and women's rights organizations. 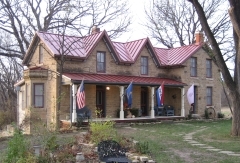 This house was built on Ritchie's 120-acre preemption purchased in 1855 adjacent to the original Topeka town site. 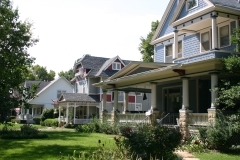 The house is an excellent early example of the mid-19th century vernacular house type known as a double-cell with two rooms of roughly equal size on each level that reflects trends of the National Folk style. It is constructed of limestone walls, with the front elevation distinguished by a full facade layer of brick applied over the limestone with decorative brick quoins at the corners. 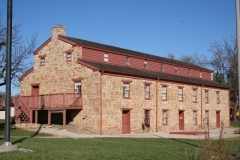 The Shawnee County Historical Society acquired the building in 1995 and began a multi-year plan to rehabilitate and interpret the property. The house was nominated for is association with the Ritchies and for its architecture. The Santa Fe Hospital Association, founded in 1884, built the existing hospital in 1930 to replace a former hospital at this location. 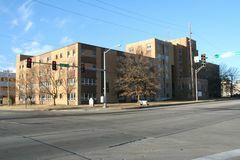 The largest of the railroad's hospitals, the Topeka hospital not only provided patient care but also served as home to Santa Fe's Hospital Association, the railroad's chief surgeon, and the medical dispensary. The hospital signifies Santa Fe's commitment to the capital city and is a physical reflection of the shared history of Topeka and Santa Fe as the railroad and city grew. The building's period of significance spans from the building's construction in 1930 to 1966, reflecting the date of federal legislation creating Medicare and the hospital opening its doors to the public. Renamed Memorial Hospital in 1972 the hospital closed in 1989 after filing for bankruptcy; the last of Santa Fe's seven hospitals to do so.